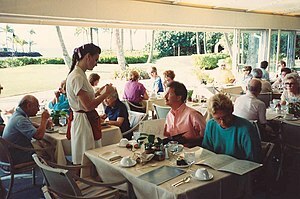 In the USA, waiters get paid a very small amount of money in order to serve you when you sit down to eat. As an ex-waiter I can personally attest to the discouragement waiters feel when they work so hard to meet people’s every request only to be insulted when the guests leave and take their tip with them, leaving nothing behind to adorn that messy display of food satiation and gluttony. Even if 10% is left, our culture equates this tipping amount as an insult. In other words, to a waiter, 10% means “you did a crappy job and youre lucky were leaving anything”. But even 10% is better than nothing. The sad thing about this scenario is that I have seen great waiters and waitresses who are snubbed with 10% – 0% tips. And yes, I too have been a victim of this insensitivity. So here’s a story a pastor friend of mine told me a long time ago that had a huge impact on me. So my pastor went to dine at a local restaurant. The waitress gave my pastor awful service. However, when my pastor left the restaurant, he made sure to give her a good tip (I forget how much, but I know it was more than 20%). Shortly after he walked out the door of the restaurant, he saw the girl running after him crying. When she reached him, she thanked him profusely. Apparently, something traumatic had happened to her and she was having a horrid day. The act of kindness really had a strong impact on her because she was not expecting such generosity knowing that her service was horrible. Of course my pastor talked to her about Jesus and if I remember correctly she gave her life to Jesus on that day. You could argue that that’s rewarding bad behavior and that her manager should have been notified and you’d be right. But how powerful it is when you know you deserve punishment and instead receive mercy. I mean, technically we all deserve punishment and yet we receive new mercies every day. So, if you want to make a difference in your small area of influence, start by always tipping. And I do mean always, even if you get bad service. You never know what the other person is going through and the truth of the matter is none of us are guiltless. So why the value judgment? Oh, and by the way, if you are a Christian? You have to tip. You have no reason whatsoever, in the least bit not to tip. And don’t you DARE not leave a tip and in its stead leave a gospel track. As if your tight wallet is good news to the poor waiter. Don’t defame the name of Christ by this ungodly behavior! This entry was posted in Advice and tagged Christian, Tips, United States, Waiting, Waiting staff. Bookmark the permalink.